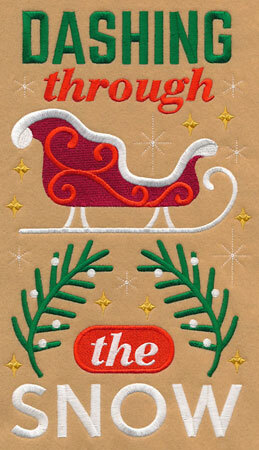 Christmas is only four weeks away, and these new embroidery designs are just in the St. Nick of time! 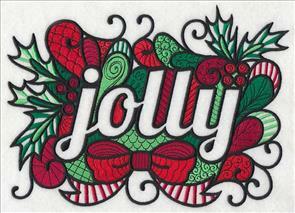 It's a potpourri -- a fun and festive variety -- of designs to suit your holiday stitching. 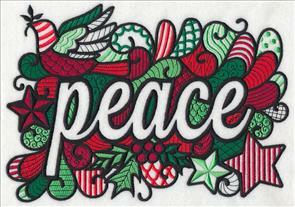 These carefully-crafted machine embroidery designs are stunning additions to your Christmas decor. Pretty birds perching on fancy ornaments are ready to be stitched and framed. Classic blackwork gets a contemporary twist with bright pops of color. 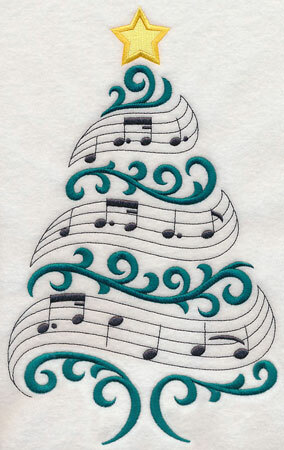 Lovely trees are filled with snowflakes, music notes, and sweet, sugary cookies. 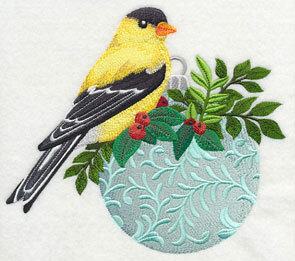 Embroider onto linen, canvas, or another smooth, sturdy fabric, and frame. 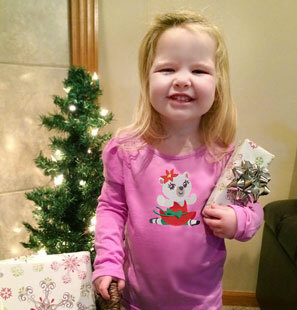 The results are fa-la-la-fantastic! Very merry birds perch prettily on fancy ornaments. 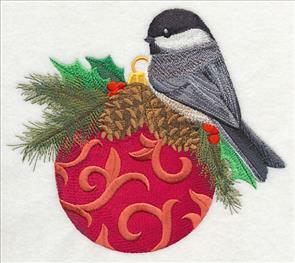 Stitch a bright red cardinal, or sweet little chickadee, on stockings and pillow covers. 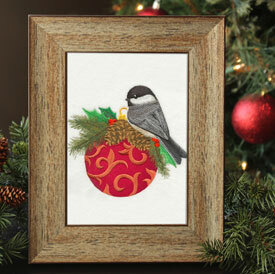 Or, make a pair of framed pieces to deck your halls for the holidays! 7.79" x 6.78" and 6.73" x 5.86" and 5.57" x 4.85"
A goldfinch perches on a bulb, decorated with fine filigree. 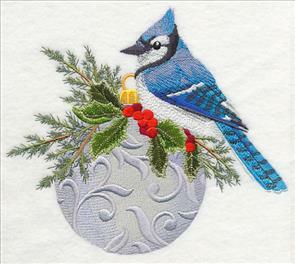 A blue jay is nestled among green holly leaves and red berries, forming a classic Christmas scene. 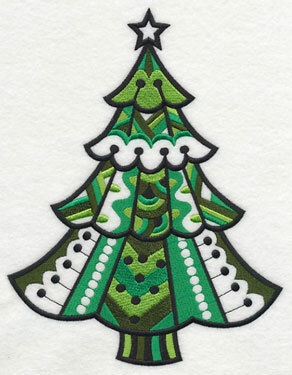 7.81" x 6.78" and 6.76" x 5.83" and 5.59" x 4.85"
Christmas trees are iconic additions to holiday decor. 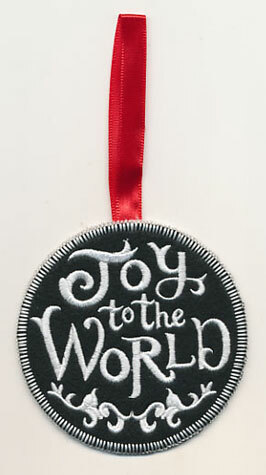 Stitch them onto tea towels, stockings, quilt blocks, wall hangings, and more! 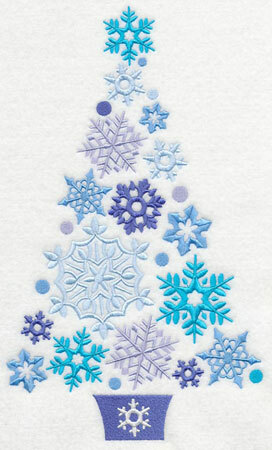 These Christmas trees are composed of frosty snowflakes, and the notes to 'O Tannenbaum." 6.85" x 11.46" and 5.62" x 9.41"
6.85" x 11.09" and 5.81" x 9.41"
4.82" x 7.81" and 4.23" x 6.85"
Stitch a crafty Christmas, tree, filled with a variety of sewing notions! 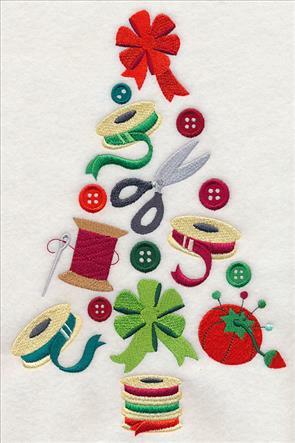 Rolls of ribbon form the tree trunk, while scissors, buttons, thread, and bows make colorful boughs and branches. 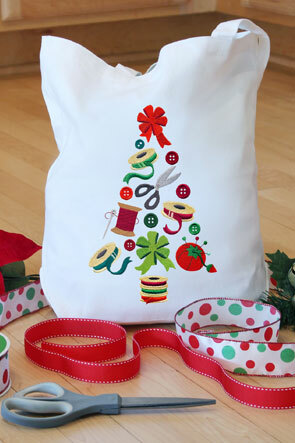 6.85" x 10.54" and 5.85" x 9.01"
5.08" x 7.81" and 4.45" x 6.85"
Corral your Christmas wrapping supplies with a tote adorned with this crafty tree! 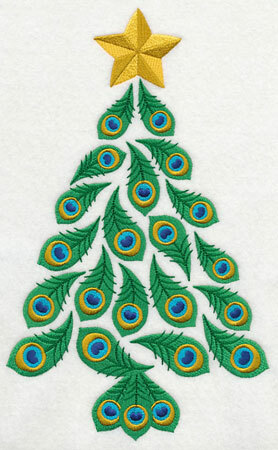 Shake your tail feathers and stitch a tree of peacock feathers on towel sets and table linens! 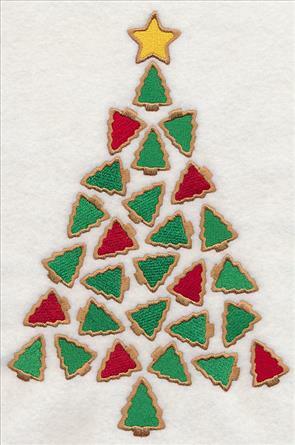 And, a tree of Christmas cookies adds a sweet and tasty effect to mug rugs and tea towels. 6.84" x 11.18" and 5.75" x 9.40"
6.85" x 10.24" and 5.87" x 8.77"
5.23" x 7.82" and 4.58" x 6.85"
Adorable animals are all dolled up in their finest Christmas tutus, and ready to put on a show! 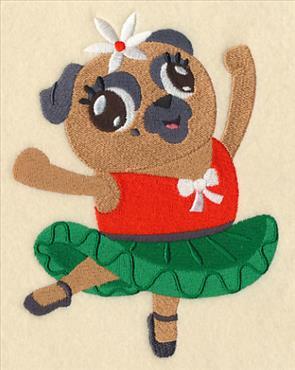 Each of the sweet dancers are oh-so-cute on quilt blocks, ballet gear, pillow covers and more. 4.85" x 5.81" and 3.22" x 3.85"
These ballet stars are a fun way to adorn kids' apparel, bedding, and room decor for the holidays. 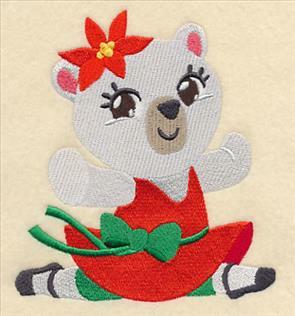 Add them to shirts, pillows, and dance attire for the little dancer in your life! Keep the cuteness going with a pug and kitten pair. 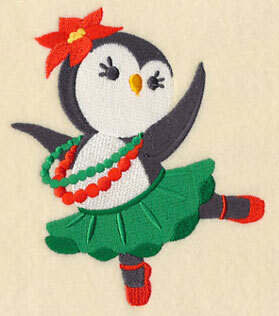 Each of the ballet animals are shown stitched in gorgeous Christmas colors and paired with holiday accents, such as poinsettias, ornaments, or holly and berries. 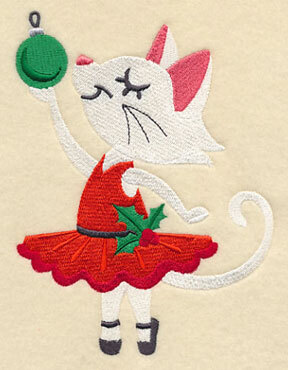 Change the thread colors from red and green to stitch these dancers year-round! 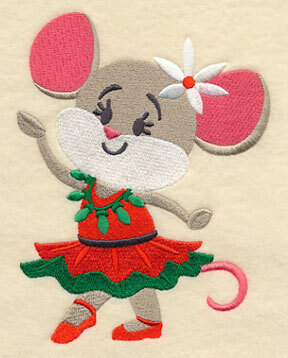 4.86" x 6.22" and 3.02" x 3.86"
A pirouetting cardinal and graceful mouse finish this charming collection of Tinseltown tutus. The fun and friendly animals are terrific additions to bath towels, pajamas, tote bags, and more. 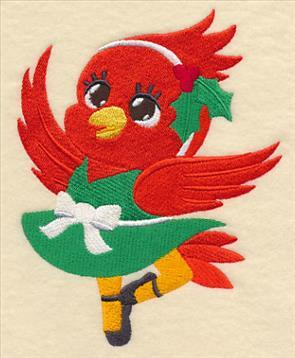 4.86" x 6.29" and 2.98" x 3.85"
These delightful ballet dancers are sure to add a delightful look to your holiday stitching. Choose your favorite by using the links above, or get all six in a design pack for an even deeper discount! 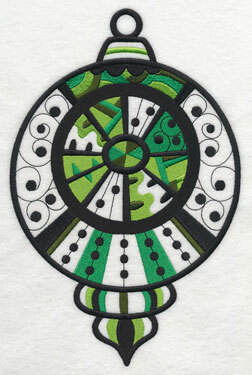 Blackwork is a style of embroidery that was popular during the 1500s. And now it's back with a contemporary twist! 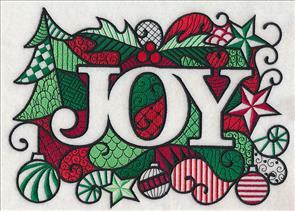 Classic blackwork elements are accompanied by red-and-green bursts of color to create eye-catching appeal for your Christmas decor. 9.55" x 6.90" and 8.13" x 5.88"
9.70" x 6.89" and 8.30" x 5.89"
7.54" x 5.35" and 6.87" x 4.87"
Add a joyful look to your holiday decorating with these stunning designs on pillows. 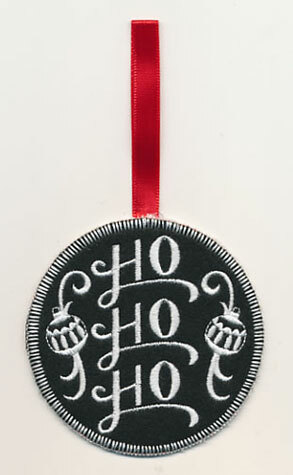 Make a pair to spread holiday cheer throughout your home! 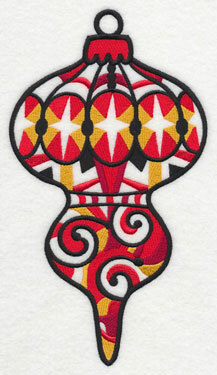 The white areas of blackwork designs are not filled in. 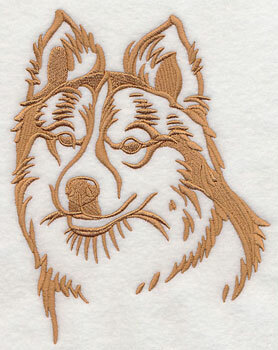 Choose neutral fabrics (no busy prints) for excellent results. 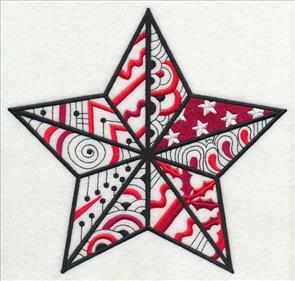 Remember: Embroidery Library's project site is chock-full of tutorials and guides. Browse through the pillow projects here, and pick your favorite to use with these blackwork designs. 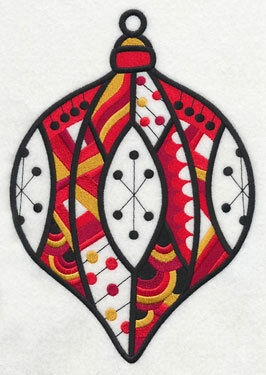 of blackwork designs are open, not filled in. 9.52" x 6.90" and 8.10" x 5.87"
9.46" x 6.88" and 8.05" x 5.86"
7.29" x 5.30" and 6.69" x 4.87"
Stitch 'noel' and 'peace' on a pair of towels, a pair of pillows, mug rugs, or placemats. Add this unique blend of contemporary and classic art forms to your Christmas gifts and decor! 9.69" x 6.89" and 8.28" x 5.89"
9.78" x 6.90" and 8.32" x 5.87"
7.52" x 5.30" and 6.87" x 4.85"
The six blackwork designs shown above can be purchased individually, or in a design pack! 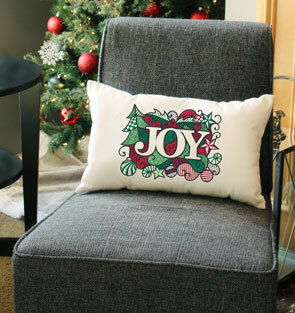 Get all six to add a very merry look to your home. 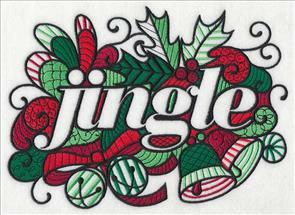 Classic Christmas motifs get a contemporary makeover when stitched in the fun and fabulous blackwork style. 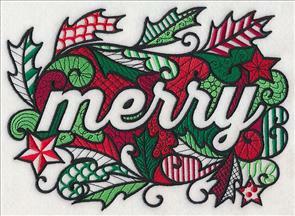 Varying shades of red and green give these embroidery designs a distinct holiday appeal. 6.89" x 8.84" and 6.09" x 7.81"
5.47" x 7.01" and 4.87" x 6.24"
7.80" x 7.44" and 7.24" x 6.90"
6.14" x 5.85" and 5.09" x 4.85"
Trim your embroidery projects with a collection of stunning blackwork ornaments. 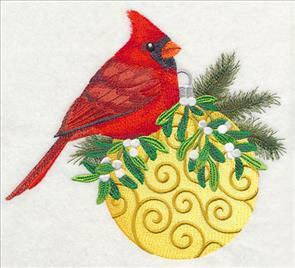 Each of the holiday decorations are modeled after vintage ornaments, and are gorgeous on tree skirts, stockings, or on a Christmas banner. 6.90" x 10.49" and 5.86" x 8.90"
5.13" x 7.80" and 4.51" x 6.85"
5.60" x 9.96" and 5.10" x 9.06"
4.40" x 7.81" and 3.86" x 6.86"
Bright and colorful reds and golds make this ornament a brilliant embroidery embellishment; geometric lines and a holly and berry pattern create a gorgeous green variation. 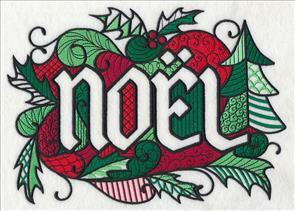 Terrific on wall hangings, lap quilts, or mantel runners. 6.85" x 9.75" and 5.86" x 8.33"
5.29" x 7.52" and 4.84" x 6.89"
3.85" x 9.97" and 3.50" x 9.06"
3.02" x 7.81" and 2.67" x 6.89"
Trim your tree with a series of blackwork designs! 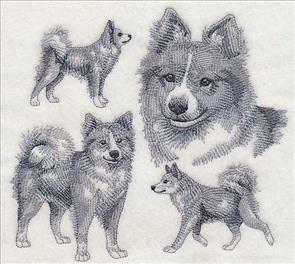 You can get each of these machine embroidery designs by clicking the links above, or get all six in a design pack. 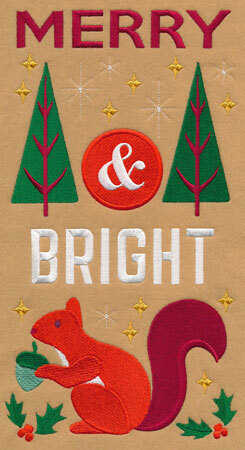 Traditional holiday icons get a modern twist in these panels! 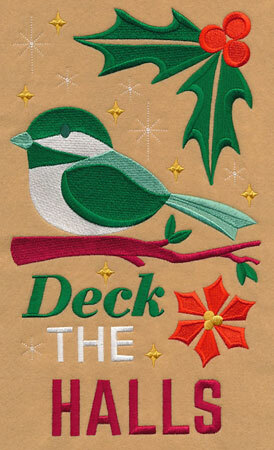 Lyrics from beloved Christmas carols are paired with a sleigh and chickadee. We used a contemporary color palette to stitch the samples that you see. Plus, the color change sheet for the chickadee includes a variation for a more traditional color scheme, too! 6.77" x 11.65" and 5.38" x 9.41"
6.77" x 11.54" and 5.36" x 9.30"
4.45" x 7.81" and 3.91" x 6.86"
"FA" and "LA" ornaments dangle down from a starry sky; a woodsy squirrel is merry and bright. If you prefer, a more traditional color scheme for the squirrel is also available on the color change sheet. 6.47" x 11.75" and 5.18" x 9.41"
6.29" x 11.64" and 5.09" x 9.41"
4.19" x 7.77" and 3.70" x 6.86"
Add a crafty look to your tree with these ornaments, made right in the hoop! These project instructions show the steps. 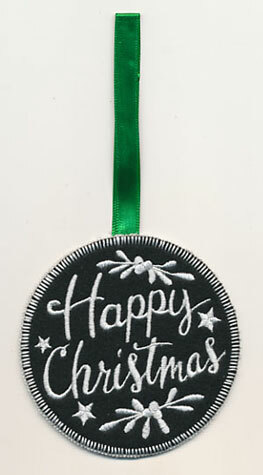 We stitched the samples with white thread on black fabric, and the result is a chalkboard style that is oh-so popular. 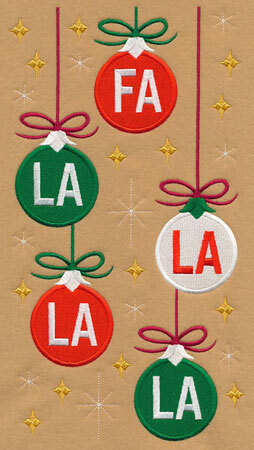 Experiment with other fabric and thread colors to match your Christmas color scheme. 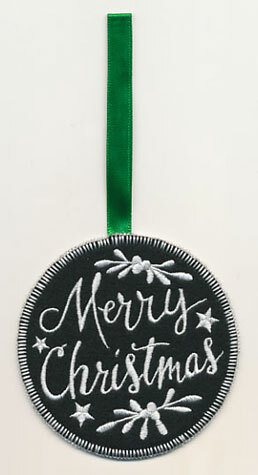 These ornaments also make excellent gift tags, are fabulous hung in windows or from light fixtures, or, put them in a Christmas card for an extra-special treat. Those of us in the United States wish each other a "Merry Christmas." But other parts of the world use "Happy Christmas." 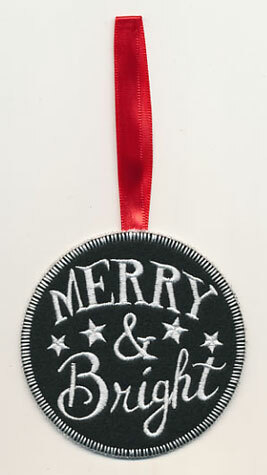 We're delighted to offer both versions, so that those around the world can hang holiday greetings on their trees. 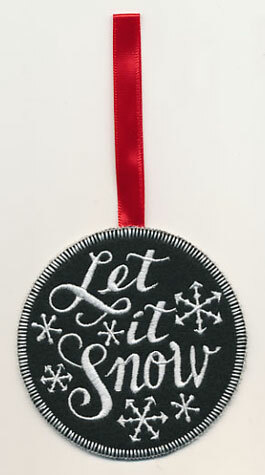 This ornament features wintry wishes, and a phrase from a beloved Christmas carol. Stitch in white on black as shown here, or in cool winter blues. Eya lives in Denmark, and she writes "I am the happy owner of an Icelandic sheepdog. I would be very happy if you are able to make a sketch of this little charming dog." Such a loving and loyal breed! Thank you, Eya, for the suggestion. Enjoy the designs! 5.86" x 7.52" and 4.84" x 6.21" and 3.01" x 3.86"